We’re all obsessed with having “perfect skin” and lots of time and money goes into creating a skincare routine that works best for us. But have you ever considered how your diet affects your appearance? Everything that you’re eating (and drinking!) impacts your skin! To help, we’ve curated a short list of items you should and shouldn’t be incorporating into your diet to help achieve that dewy, soft skin we all dream about! Veggies are great for you and your skin, no surprise there! But did you know vegetables like spinach and kale can neutralize free radicals in your body? Or that tomatoes (we know, it’s technically a fruit) - can help reduce sun damage? Eating your veggies is a great first step towards improving your skin. Foods like bell peppers, strawberries, and broccoli are not only delicious, but are full of collagen-boosting vitamin C, which helps promote your skin’s elasticity. Dry skin? Water is the easiest fix! 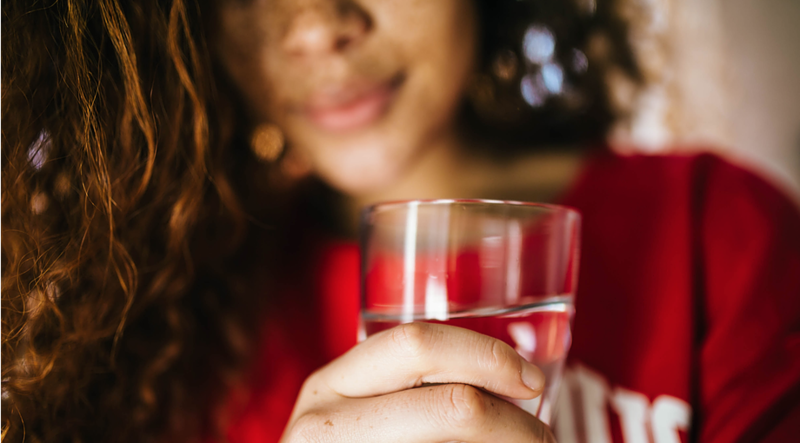 Drinking water not only hydrates the skin, however, it can actually help plump the skin cells and delay signs of aging. Drink up! Who doesn’t love a donut or slice of cake every now & then? Everyone!…except your skin. Sugar can trigger insulin spikes which can lead to inflammation (aka pimples). Next time, pass on the sugary treats and instead reach for vitamin-packed fruits such as strawberries, oranges and blueberries! Although a nice treat, alcohol could be a main culprit when your skin isn’t looking it’s best. Drinking leads to facial flushing, broken capillaries, and can worsen rosacea. Plus, it’s a major dehydrator, which can leave your skin looking dry. Because processed foods have a high glycemic index and break down quickly in the body, they can seriously spike your insulin and cause inflammation. The easy explanation? It’s basically acne waiting to happen for your skin. Try and stick to foods that are grown in the ground or contain only a few, simple ingredients.